Buy a sturdy and Ergonomic Office Chair or Ergonomic Computer Chair that fits you properly. You may need to visit a specialty office store or ergonomic office products company to find suitable products. The chair needs to allow height adjustments, depth adjustment, and provide lumbar support. The Business and Institutional Furniture Manufacturer’s Association has Chair fit guidelines. Check your posture after 15 minutes, are you slouching? Strengthening your back and shoulder muscles will allow you to maintain a better posture. Forcing yourself to situp only works to a point. Consider taking a posture class. In the San Francisco Bay Area, I found two different outfits. Balance Center and Gokhale. Your work area must properly fit your body. BUY a new desk if need to. The work surface must be at the correct height. Keyboard and Mice should be on an adjustable height platform, no two people are the same size! Your elbows should never be higher than your keyboard, but at a seated elbow height. Elbows should remain close to the body, forming a 90° angle. Adjustable keyboard trays can help. Sit close to the desk or keyboard tray to reduce arm extension. Keep your shoulders relaxed. Mice should be close to your body, not out to the side or high on your desk. Try to minimize the distance between the keyboard and the mouse to reduce lateral arm movement. Wrist, hand, and forearm should form a horizontal straight line. Monitors need to be positioned so the top area on the monitor is level with your eye, using stands or phone books. Consider computer glasses if needed. Put the monitor 1 arm length away. Also consider a sit to stand Workstation that can help you to change positions. New desks with treadmills are starting to appear. Try them out and also consider them. You should still change positions from time to time. Your vision affects whether you start leaning in to see your monitor. Make sure your prescription is up to date. Consider making special prescription computer glasses. I have done this and found it helps ALOT. Setting up or upgrading your ergonomic input devices and Ergonomic Keyboard to those from vendors like Kensington or Kinesis or Kinesis Freestyle. The mouse should your hand, use smaller travel mice for smaller hands. Consider multiple input devices and swapping them every couple hours. An automatic mouse clicker also helps. Taking Breaks is incredibly important. People need to break up repetitious work like typing or mousing by getting up and stretching every 15 minutes or so. Perform the stretches that your therapist recommended. One of the problems that I had that you can learn from is stretches need to be held for 30-45 seconds, and performed several times a day. I perform them too quickly to achieve any benefit, for way too long. It took a long time for me to understand that my hand pain was caused by impingement of the median nerve that starts up by the neck area, travels through the arm, and ends up in your hand. I thought that my problem was in my hands, while the problem was really up by my Pectoralis muscle near my upper torso area. The body when under stress tenses up its muscles. As you work for long periods of time, you will unknowingly cause your shoulders to hunch and stiffen up. After years of abuse, your shoulder muscles including the traps will become pretty stiff. Mines needed a lot of body work to soften up. The head is incredibly heavy. Supporting it for hours at a time especially with a forward tilt will cause a lot of problems. You can walk into virtually any office or coffee shop and see people with their head tilted forward staring at a screen. This causes the muscles in the neck, shoulder and upper back to get strained. It took me a while to understand this and to correct my posture, while working to soften up these muscles. This is a good stretch for me as my Pectoralis Minor is tight. This muscle is a major culprit when you have poor posture, like me. The shoulders get rounded and pulled forwards, so doing the following stretch really helped me out. Again, you need to hold it for at least 30 seconds. Subscapularis is near the underarm, and is another problem area that I needed to work on. Taking breaks during computer use is critical to healing. 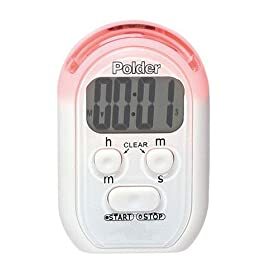 I use a timer like this Polder Digital Timer to remind me to take breaks. I set it for say 20 minutes, then it beeps and I stop using the computer and take a break for 20 minutes. You can vary the amount of computer usage and break length depending on your injury status. Voice Recognition software reduces your hands usage and hence speeds your recovery. Few people think of having good posture while sleeping. I’ve noticed that sleeping on one side can cause compression to my muscles and occasionally cause an ache to some of them. I have also slept on top of my hands or cocked them in a bad position during sleep. What is good sleeping posture? Professionals can examine your workstation and work habits and give you customized advice. This cost a couple hundred of dollars but has proven useful for me. Here are some site with useful information. PRINT OUT the information you need. Do not use your computer more than necessary. American Journal of Roentgenology has a good article covering computer ergonomics and Carpal Tunnel Syndrome. The diagrams show exactly what type of situations you should avoid. Remember that just setting up your workstation correctly will not result in instant healing from Carpal Tunnel Syndrome. You have been injured and will probably need months to heal.